The vishvarupa.com website was started by Gerald Joe Moreno – earliest known entry being October 5, 2003. One may note. however, that Moreno either got removed or avoided archiving the pages in a period where he had his own photograph plus extensive account of his first knowledge of – and visit to – Sathya Sai Baba, including where he was “oiled in privacy on the lower stomach by Sathya Sai Baba” All his pages are filed, however, including the extensive abuse pages against the Sai petition and libels against the many critics which he also had for some years on the same website, but removed them. 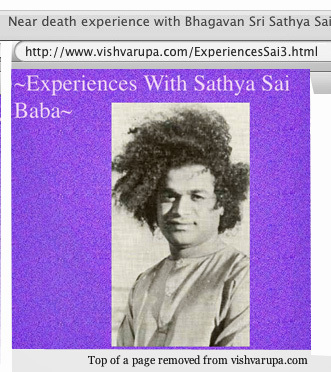 Since I seldom look at his libelous and extremely voluminous, tedious and finicky websites, I did not notice until I just did a Google search on some keywords that he re-posted the materials at ( http://www.geocities.com/www0db0www/ExperiencesSai.html — and at sathyasaibaba.wordpress.com/page/54/ and on his main libel site, saisathyasai.com. So be it. He also DID remove them from vishvarupa.com, so I was right in my statement. ” On my “Mandalas” link, not only do I have Mandala Art and information about Mandalas and Chakras, I also have Mandala Pictures of Ganesha, Lakshmi Devi, Shiva-Shakti and Kali.Also, if you are looking for Mandala Books, Mandala Links or Mandala Images you will also find them through my “Mandalas” link. avacados and almonds.Something magical about herbs. My Favorite herbs: Rosemary, Thyme, Sweet Basil, Sage, Mint, Lemon Verbena, Oregano and Garlic Chives. Flowers I like: India Jasmine (most fragrant jasmine in the world), Roses of all types, Cactus Flowers, Honeysuckle, Portulaca, Magnolias, Tulips, Hyacinth, Geraniums, Vinca, Carnations, Sunflowers, Azaleas, Iris, Lavender, Sun Flowers and Alyssum. I collect crystals. My favorite Crystals are: Smokey, Rose, Milky, Rutilated and Clear Quartz, Carnelian, Azurite, Emeralds, Obsidian, Petrified Wood, Kunzite, Moonstone, Tourmaline, Selenite, Jade and Turquoise. I’m rational, logical and down to earth. Yes, seriously. I’m Caucasian/Italian/Mexican Blend and 34 years young. This entry was posted on April 25, 2009 at 8:09 am	and is filed under Cults, Gurus, New Age, Sathya Sai Baba. You can follow any responses to this entry through the RSS 2.0 feed. You can skip to the end and leave a response. Pinging is currently not allowed.